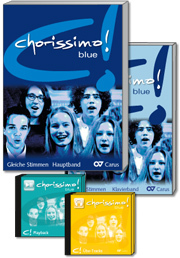 The full PREMIUM Set with the complete material required for a concert. 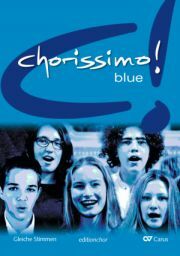 For every youth choir, making the transition from singing in unison to singing in parts is an exciting process. chorissimo! 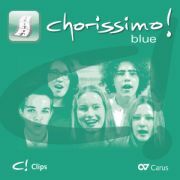 blue, the new volume for equal voices in our successful choir series chorissimo!, accompanies and supports this process. It contains a wide range of carefully-chosen and stylistically varied pieces, presented for flexible use, as well as versatile practical working material, including playback, audio and practice track CDs, and a DVD of video clips. The volume, structured for graded learning, progresses in six steps from unison singing, via canons and quodlibets, to homophonic and polyphonic two- and three-part pieces. 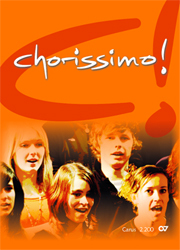 Different workshops, some of which feature on the video clips, focus on individual aspects of choral work, such as warm-ups or beatboxing. All the pieces have a piano accompaniment; in addition, some pieces can be accompanied by additional instruments or band. Flexible part material is available for this. 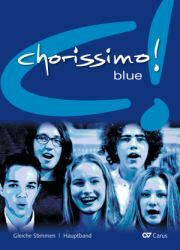 As well as the choral arrangements, for all the pieces the main volume contains a piano accompaniment, workshops (including beatboxing, warm-ups) and background information. 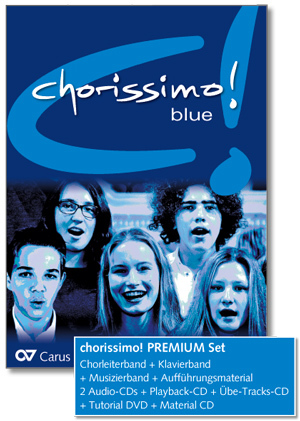 The full PREMIUM set contains the complete material required for a concert – the main volume, with piano accompaniment for all the pieces, a separate performer’s volume for bigger scorings, and all parts for melody instruments in B flat and C, bass and percussion.